By LUDWIG VON KOOPA - ...Featuring lowered expectations that everyone knew would happen. Today, Nintendo released their quarterly update about the state of their business, covering the beginning of October to the end of December—the biggest time period for them of the year in terms of selling software and hardware. I'd say it didn't disappoint, but their stock dropped 4% today, so it kind of did. That's because Nintendo's goal of selling 20 million additional Nintendo Switch consoles from April 1 2018 to March 30 2019 was reduced to a goal of 17 million. I thought everyone already knew that Nintendo's goal was overly ambitious and they weren't going to reach it, and that would have already been baked into Nintendo's stock price. Featuring no sales data on ARMS, Xenoblade Chronicles 2, or the Nintendo Labo! I'm pretty sure, to this day, ARMS is outselling the Nintendo Labo, collectively. One Labo is too many, so over a million Labo is a concern. 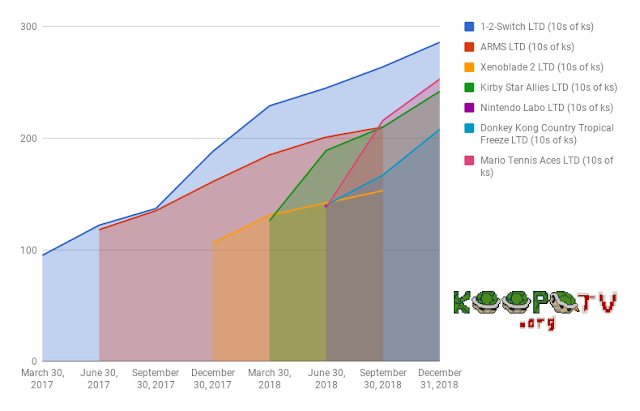 In any case, KoopaTV's anti-Labo crusade is clearly having a big impact and the Labo is widely considered across the industry to be a failure. That's another victory. The Nintendo Switch has now sold over 32 million systems, and 12 million people now own Super Smash Bros. Ultimate. That's a RIDICULOUS number of people. I'm a bit concerned about how Pokémon: Let's Go, Pikachu! and Pokémon: Let's Go, Eevee! collectively have sold 10 million units. You think that the changes brought by Let's Go (and Pokémon GO) are just going to stay a sideshow? Not with those sales figures. That's bigger than over a year of Splatoon 2. These casual Kantonian messes will influence everything else in the Pokémon series going forward in some capacity. Believe me. Metroid Prime 4 is still a temporary name, and the release date is still To Be Announced. That announcement last week about its development? Doesn't mean anything. Speaking of which, Mario Kart Tour, a mobile device game, got delayed. I forgot it existed. Dr. Mario World was also announced as another free-to-play mobile game in the pipeline, because Super Mario World wasn't enough of a world-destroying exercise. That's really it. There will be an investors question&answer session after this article publishes that will get its own article if there's anything interesting asked (and/or answered), or if I want to do something filler on this site. Future is a bit bleak, folks. But at least the end of the world probably won't come from the Labo. Just watch out for fake doctors popping pills to people on a planetary basis. Ludwig hopes that Kirby Star Allies gets to remain on the list of games that Nintendo reports sales figures on, because then he could point to his late (but complete) review of Kirby Star Allies as giving the game extra sales momentum, similar to how he's taking credit for the Labo's commercial failure. The previous quarter's financial numbers article is here, with a bit more interesting information in it. As Ludwig said he would do, here is the article based on the follow-up material from the investor presentation.